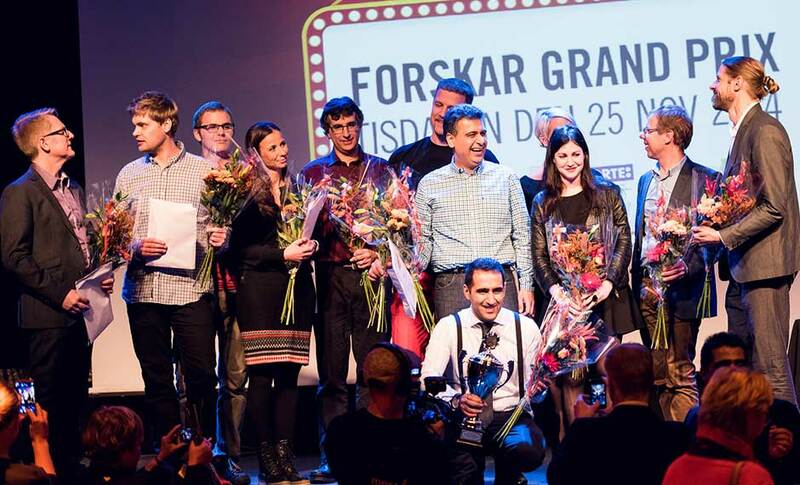 The Researchers’ Grand Prix is a Swedish competition in which researchers compete to give the best presentation about their research within a set amount of time. Between 5-8 researchers have just four minutes each on stage to present their research in front of a public audience. A jury of three people, representing academia, the media and the performing arts, judges the presentations on the basis of performance, structure and content. After a quick reminder from each of the competitors, the public is invited to vote using an audience response system, SMS or some other method. The jury then awards its points. The points are added up to determine the winner, who goes forward to a national final held in Stockholm in the late autumn. The concept originates from the University of Southern Denmark. The competition took place for the first time in Sweden in Autumn 2012. It is organised by VA (Public & Science) and the research councils Formas, Forte, VINNOVA and the Swedish Research Council. Regional heats are run by local organisers as part of the annual science festival Researchers’ Night. The aim is to raise the profile and status of researchers as well as showcase the breadth of Swedish research. Preparations: Find researchers who wish to compete. Anyone who works with research in the private or public sector in Sweden is welcome to participate. The competition is not, however, open to those who work professionally in science communication. The presentation should be given in Swedish. All participants receive inspirational coaching in presentation techniques and storytelling. Invite three people to sit on the judging panel. A person skilled in journalism, a prominent scientist and a person with experience of the performing arts. Each member of the jury should evaluate the participants’ presentations based on their own area of ​​expertise. Challenges: Ideally you want participants to come from a range of different institutions, companies and workplaces. Participants should also represent a diverse range of disciplines. Often, it can be difficult to recruit participants from the humanities and social sciences. Remember to try to get a good gender balance among the competitors and the jury. There will be better interaction between the jury members if you are able to brief them and get them together before the competition. They should fully understand the concept. Their feedback to the contestants should be positive and constructive. The organisers must ensure that the researchers receive training / coaching in presentation techniques prior to the regional heats. For example, beforehand you could run a joint session where participants can get to know each other and receive coaching from a local communicator/actor or researcher who is an experienced communicator. Each contestant should also receive some short individual coaching and help to fine tune their presentation. Benefits: The competition is a way to disseminate information about research and researchers in an accessible but serious way. The format may attract new audiences who do not normally come into contact with science. The researchers receive training in how to present their research in a short and comprehensible way, which often leads to them being asked to present in other contexts, for example in the media. Resources: Read more about the concept at www.forskargrandprix.se their explanation. Competitions and games can be an effective way of capturing the visitors' interest and at the same time conveying knowledge about science and research. By allowing visitors to compete using methods linked to research, it is possible to mix business with pleasure. When planning, it is important to work out how many people can play at a time as well as how you will deal with people waiting in the queue. Consider awarding prizes to any winners or arrange a lottery with prizes for contestants, to attract participation. Also, advertise the activity well in advance. Many of these activities are particularly suitable for younger audiences.